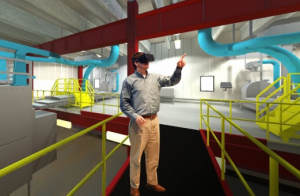 We've all been hearing a great deal about how construction management is being enhanced and improved by emerging technologies. Indeed, many of you reading this can probably think of examples of ways that you’re currently employing all the new technology in construction job sites, from hybrid vehicles to software that snaps selfies. Since we're also an industry that's reluctant to try new ways of doing things, your willingness to do this is good news. But that technology you may be using now is but the tip of the iceberg. There are a number of new construction technologies either available now or in the pipeline that one day soon will be as ubiquitous on a construction site as scaffolding. Augmented Reality (AR) Devices Have you been brushing up on your Pokémon Go? Because this technology, which allows graphic images to be superimposed over what you're seeing, is available now for construction use. So why aren't you seeing your construction superintendent walking around the site wearing a glorified Viewmaster? Some production problems continue to dog AR viewers, but a larger problem is that the industry isn't yet embracing this technology. Hopefully this will soon change, as blueprints, as-builts, and other construction paperwork in AR form can make sites both more efficient and safer. Drones Drones! They're cool! They're controversial! And while the FAA is still hammering out some fine points, they're now acceptable for commercial use, including on construction sites. Given that drones can be employed there for mapping, photography, project monitoring, and even deliveries, from a project management standpoint, these devices could be very useful in saving time and money. Just be aware that strict rules continue to govern drone use, and a designated pilot and plenty of liability insurance are musts when using them. 3-D Printers No, all the bugs aren't out of these devices yet. And some legal and ethical questions remain concerning their use. But don't expect these "printers" to be going anywhere either, especially in construction. It's anticipated that these machines will be used for "additive manufacturing" rather than create a building from soup to nuts (or nails to drywall), but even when just used for producing components, 3-D printers can provide considerable benefits. And as London's FreeForm Project pointed out, these printers also produce impressive and detailed 3-D architectural models. Multi-Tasking Vehicles These self-operated vehicles aren't making coffee runs yet, but they're currently striping asphalt and hauling and placing equipment on American highways, and transporting materials for an Australian mining company. While these vehicles will continue to have at least a "remote" human operator, they're already cutting down on the need for manpower, reducing fatigue, and increasing productivity. Mobile Technology Everyone's got at least one device, and they're not just for texting or game playing anymore. Applications like Raken for daily construction reporting means that this paperwork can be completed far more accurately and quickly than with conventional methods. And in addition to construction daily reports, software programs like Raken can be used to produce crisp photographs and streaming video, monitor and provide updates to work in the field, and track employee hours. Raken allows all of this data to be compiled into a single report as well. So construction management should embrace this and other emerging technologies, as they’re leading the industry down a more prosperous and efficient road. Learn more about the new innovations in the construction industry on our blog.